Follow the adventures of a displaced South Dakotan who is always on the move! She answered, “I loved it! I am feeling so many emotions from this book right now!” Wow. I had never seen her respond to a book like this before. She asked many questions about it, so I promised to find out as much as possible for her about the librarian of Basra. I hadn’t looked at this book in a long time. It was discovered in the most unexpected of places, a scratch and dent store in Independence, Missouri. I was cruising the book section, not really looking for anything at all, and then I found this book. I stood in the store and read it, not quite believing the great fortune I’d stumbled upon. Reading the story made me feel connected once again to people I had known and lost — friends on the other side of the world who I never would have met had it not been for a war. People who did nothing to deserve the wrath that had been raining down on them. The story is written and illustrated by American author Jeanette Winter, known for creating vibrant true tales about real life heroes in a way that is palatable for younger audiences. This story is about Alia Muhammad Baqer, the chief librarian in Basra, forced to give up her building and livelihood when the governor decides to use it as his new headquarters. Baqer’s courage and tenacity saves around 30,000 rare and valuable books from destruction when the library burns to the ground during the early days of the Iraq war. Although she cannot save every book, Baqer’s efforts prevent the entire collection from being lost and she becomes a local hero. At great risk of her own safety, Baqer chooses to rescue knowledge, because as a librarian, she knows how intrinsic books are to the survival of her culture. American cartoonist Mark Alan Stamaty, also depicts Baqer’s story in a graphic black and white comic book format, also child-friendly. In the Amazon.com reviews section of Stamaty’s book, a reviewer by the name of Judy K Polhemus had this to say: “As a girl, Alia had read about the Mongol invasion of Iraq and the burning of the Baghdad Library. She equates the burning of a library and its books with the destruction of the culture of her country. Burn a library and you burn a collective recorded memory. Alia singlehandedly assumes the responsibility… She stuffs her purse and loads her arms under her shawl and walks out, loads her car, returns for another load. City and military officials who now occupy the library, daring the enemy to bomb their library, pay her no heed. She fills her car. Further research cemented my respect for Baqer, her courage, her passion for books, her legitimate concern that the destruction of the library would mean severe damage to civilization itself. In Pam McAllister’s blog post Lawbreaking Librarians: A Legacy of Courage, Alia is the featured heroine who rescues a critical piece of her culture in the face of “the war against books”. Not too difficult to imagine Baqer’s source of courage. She is a book lover after all, and to her, books are the most important tools for building society. Knowledge is power. On women’s history site A Mighty Girl, Winter was asked in an interview how she made her stories, often about heroes in nearly impossible circumstances, accessible to young readers, and whether these stories are even historically valid to these readers. 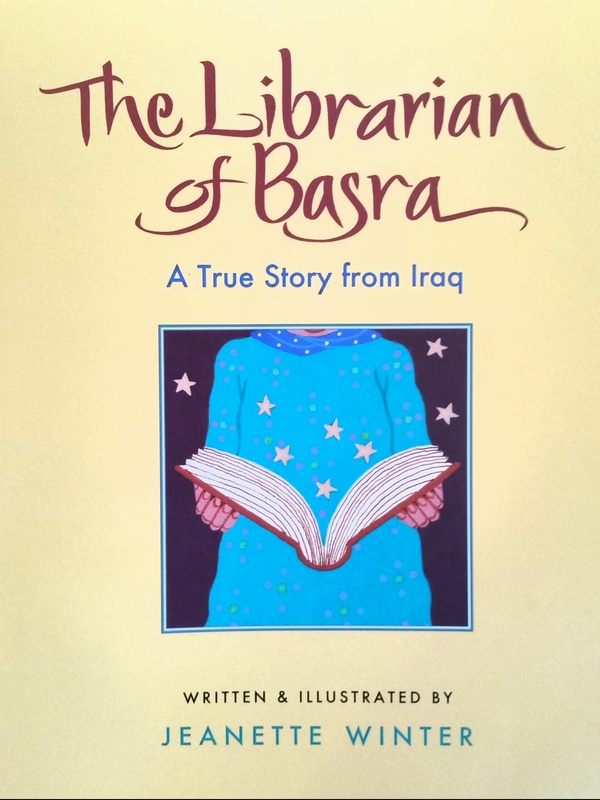 Winter asserts that her works, especially ‘The Librarian of Basra’ depict stories in an “even-handed” manner, through strong, colorful graphics and easy to understand language, allowing young people to find meaning that they can comprehend. Winter also states that despite the academic argument that children care little for history, it is possible to cultivate love of learning through “good, accurate story-telling”. 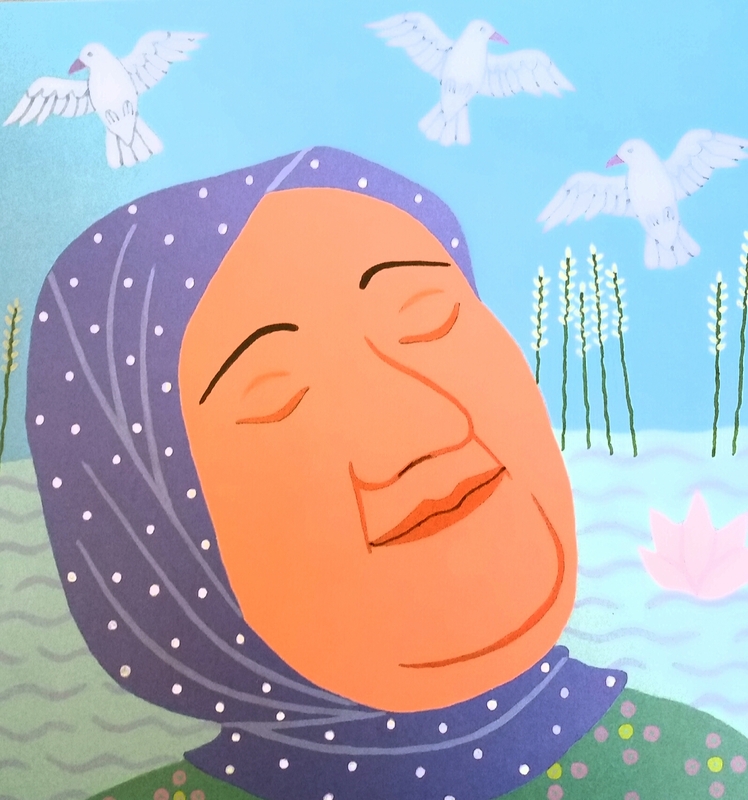 Illustration of Alia Baqer dreaming of peace and a new library, from Jeanette Winter’s ‘The Librarian of Basra’. This morning I was well equipped with several sources to back up the story of the Librarian of Basra and give my daughter the information she wanted. I know that she is a book lover like myself, and she also cares deeply for others, so she would find what my discoveries quite valuable. We had a nice talk before school. I showed her a photograph I found of Alia Baqer in 2013, on the tenth anniversary of her mission to save the books. She is now an old woman, sitting at a desk, working with a large hard cover book. She looks like she is happy and at peace. This photograph made my daughter very happy. It made me happy and sad. It’s difficult to explain how books and stories can create common bonds from across the globe, but I hope that somehow, Alia Baqer can know that her story inspired a little girl in the United States to be a courageous person. My daughter asked me about my experience in Iraq. I showed her my collection of photographs — friends and places once visited and long since left behind. I told her some of the stories of heroes I met there. I told her why people were scared of Saddam Hussein, and why the bombs were falling on Basra when the librarian was trying to save all the books. I explained to her why it is important to save knowledge and tell stories. She gave me a hug and said “I love you Mom” when she left for school. I looked at all my books and smiled. I wrote this post because I was so touched by my daughter’s interest in the story of Alia Baqer. I have noticed that, as Ms. Winter asserts, children really are fascinated by history. Effective tools, such as children’s books like ‘The Librarian of Basra’ and Mr. Stamaty’s true life comics, can help us teach important history lessons to younger generations. More importantly, we as parents and educators also need to have conversations with children and answer their questions so that our history as people is not swept under the heavy, musty rugs of time. This entry was posted in Deployment Retrospective, Parenting, Special Topics and tagged Alia Baqer, Alia Muhammad Baqer, Books About Books, Children's Books, Children's Books About the War in Iraq, educational comic books, Historical comic books, Iraq, Iraq War, Jeanette Winter, Literature about Iraq, Mark Alan Stamaty, Stories about Basra, Subversive Librarians, Telling Children About the War in Iraq, The Librarian of Basra, The local librarian of Basra on September 10, 2015 by Georgeann. Copyright Georgeann Van Delist and www.bloggingpioneer.com, 2014. Unauthorized use and/or duplication of this material without express and written permission from this author and owner is completely prohibited. Excerpts and links may be used, given that full and clear credit is given to bloggingpioneer at WordPress and/or Georgeann Van Delist, with appropriate and specific direction to the original content. Teddy, being adorable during a nap. Resting with my son on Saddle Pass. Our new family member, Theodore Baker, enjoying the beach as Lake Kampeska, in Watertown, South Dakota. Ross the Dog on his final journey. Photo credits: Stacy Pearsall, Veterans Portrait Project. I retain no rights. Fishing Lake Kampeska, Summer 2013. Making Mount Rushmore a little bit sexier. Van taking a stroll at Bridal Veil Falls, Spearfish Canyon, SD. Copyright Georgeann Van Delist, 2014. Homesick for the Black Hills! I sooo want a pet chicken! My son enjoying a quick climb on the Badlands this summer. My adventures in Wonderland wherever that may be! If you have butter on your head, don't go out into the sun. News, resources, art and ideas!